The ALZO Drop Ceiling Background Support kit is an inexpensive and handy solution for hanging photo backgrounds in an office or any room that has a drop ceiling with T-bars. 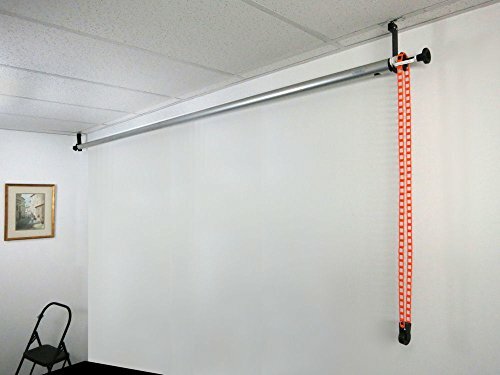 This background support system attaches to the drop ceiling frame T-Bars and provides a chain drive to roll down paper or muslin backdrops, up to 10 feet wide. The sturdy 2 inch diameter aluminum tubing assures that a paper background will remain straight and does not warp after months or years. Installation may require the addition of ceiling support wires, and in some cases may require the addition of a piece of T-Bar support frame. The kit includes 2 hooks, 2 X-clamps that attach to the ceiling frame T-bar, 1 aluminum pole 10 feet long and 2 inches in diameter, 1 two-piece roller set with chain and weight, and detailed installation instructions. This product carries a 5 year warranty.